This is possibly the best and most useful article I have ever read in a journal. 2) Can community care workers deliver a falls prevention exercise program? A feasibility study. Community care workers who have completed appropriate training are able to deliver a falls prevention exercise program to their clients as part of their current services. Further research is required to determine whether the program reduces the rate of falls for community care clients and whether integration of a falls prevention program into an existing service is cost-effective. There is no one single definition of a carer, but a widely accepted definition is that a carer can be defined as someone, adult or child, who provides unpaid informal support to family or friends who could not manage without this help. This would include caring for a friend or family member who due to illness, disability, a mental health problem or an addiction cannot cope without their support. A role that is often underpinned with love and affection as well as a sense of duty. In addition it is important to remember that some carers can derive personal satisfaction in delivering this role. “It is not surprising, therefore, that being a carer often raises difficult personal issues about duty and responsibility, adequacy and guilt”, all of which impact on their well-being. Iain to talk about Tronto’s framework for understanding the concept of care identifying four aspects to care: Caring about, taking care of, care-giving and care receiving. The majority of carers’ provide between 1 -9 hours care a week undertaking tasks such as shopping and cleaning. However, 2.9% of the female population and 2% of the male population provided intensive care of 50 plus hours a week. In reality many people do not recognise themselves as a carer but identify as a husband, a wife, a daughter, a son, a friend, a view, which has the potential to impact on the figures. We all can make a basic assessment of carers needs and refer onto appropriate, more qualified people. Projections suggest the demand for such care will more than double over the next 30 years’ by 2037 the estimate being 9 million carer, with the number of female carers being notably higher. In 2011 57.7% of carers were female and 42.3% were male. The highest share of the unpaid care burden falling on men and women aged 50-64. In addition the census indicated that when women reach 50 they are likely to spend 5.9 years of their remaining life as unpaid carers. In contrast, men at 50 are likely to spend 4.9 years of their remaining life as an unpaid carer,. provision: is there an impact on health and economic position? However by the age of 65, these figures reverse, with women likely to spend 2.6 of their remaining years as unpaid carers, and men 2.7 years. In addition there are more male carers (15%) than women (13%). Older people provide almost half the co-resident care for older care-recipients, the care taking place predominately within the context of spouse-type relationship, which leads to greater provision of personal care tasks and increased hours of care giving. In addition there is a significant increase in the amount of care the carer is providing to a person with dementia, which increases the risk of stress related illness for the carer. The rise in unpaid carers can be attributed to an ageing population brought about by improved life expectancy for people with long term conditions or complex disabilities, meaning more high level care need to be provided for a longer period of time. Only last year (2017) Analysis produced by the Office for Budget Responsibility, which accompanied the Autumn Budget showed that English councils withdrew £1.4bn from emergency reserves, with experts say is ‘unsustainable’ in relation to providing social care. According to the Kings Fund Local authorities face a huge funding shortfall that is set to reach £2.5bn by 2020. In addition to the shortfall in funding it is estimated that unpaid carers save the government £119bn a year (Buckner, 2011). The willingness of informal carer to continue in this role therefore places them at the centre of future social care planning. Across the EU, care policies have tended to develop in isolation from policies for employment/equal opportunities. In the few countries (such as Finland and Denmark) that are beginning to take a more strategic approach to older people’s issues, the issue of support for employed carers is beginning to be addressed, partly because of the strong similarities to the business case for older workers – indeed, many working carers of older people are also older workers. Carers lose on average £11,050pa by taking on significant caring responsibilities. Quince(2011) identifying that many carers face financial concerns and have to use their private savings to meet household bills and the additional costs incurred due to the need of the person they care fore such as heating, laundry and specialist equipment i.e. a stair lift. Over half of all carers have a caring-related health condition, with 625,000 people suffering mental and physical ill health as a direct consequence of the stress and physical demands of caring. The Prepared to Care Report (Carers Week, 2013) found that six out of ten carers have experienced injury or their physical health has suffered because of their caring role. Carers UK: Facts and Figures. Leads to a lack of sleep. Asking the question “Overall how burdened do you feel?” is a useful, quick way to assess carer distress. Mental illness and emotional problems can alter behaviour in ways that relatives find distressing. For instance: an older person with dementia may not recognise family members; the long-term effects of some medication may lead to a loss of sexual inhibitions. The older person may no longer seem to be the same person – no longer the person the relative had known and loved. Mental illness and emotional problems can alter relationships. The hopelessness, despair and apathy of a severely depressed person can be very hard to live with, for example. And forgetting that you are married or have a daughter can make it hard to maintain meaningful family relationships. The stigma of mental illness remains powerful in our society. It is not unusual for carers to feel ashamed or embarrassed that their relative has mental health problems, or guilty that this is the way they feel. The carer’s own social life may be affected. Social occasions may become difficult or embarrassing, and so social gatherings or going out may be avoided. Changes in behaviour may mean that the older person cannot be left on their own safely, so that even a quick dash to the shops becomes fraught with anxiety. Day-to-day frustrations, such as endless repetition, being continually followed around, or being unable to encourage the older person to complete the simplest task, may have a serious cumulative effect on the carer’s ability to cope. It is important not to make any assumptions, regarding a carer’s capacity or willingness to either start to take responsibility for, or to continue to care for a person. It is important to acknowledge that the carer may have different views from that of the cared for person and that the views of all parties should be considered and balanced where possible. Having a break from caring is vital to the wellbeing of carers, and has been recognised as such by national policy (Department of Health, 1999). However when the carer is caring for a person with dementia this can be particularly difficult due to the problems of communication and orientation to the new environment. It is important to respect and recognise that carers will have their own support needs, rights and aspirations, which may be different from that of the cared for person and that for the carer to engage in activities important to them this may at times involve an assessment of risk and the need to respond appropriately and manage this proportionately. It is also important to recognise that the caring role will come to an end and to consider that the carer will experience loss and grief, for which support may be required. 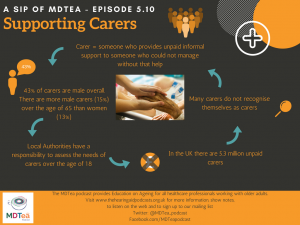 The caring role has historically been identified as a role undertaken by females but the number of male carers, particularly amongst older carers is high, with more that four in ten (42%) of the UK’s unpaid carers being male, dispelling the myth that most carers are female. The Carers Trust and the Men’s Health Forum report ‘Husband, Partner, Dad, Son, Carer?’ looks into the experiences and needs of male carers to raise awareness of the needs of this group of carers. which potentially impacts on the support they obtain at work – it is important to remember that people work longer and the retirement age is being extended. Four in ten male carers said that they never had a break from their caring role. A concern as Singleton et al (2002) identify that fewer carers experience mental health problems if they have taken a break since beginning their caring role. 55% said that their health was “fair or poor”. A result matched by the research, which widely recognises the impact on health e.g. higher levels of back problems and sleep disturbance being common problems. Eight out of ten male carers who are not working due to their caring commitments expressed the view that they felt isolated and missed the opportunity to spend time with friends and family members. Just fewer than 50% of respondents had not had a carer’s assessment. Although Male carers aged 18–64 are even less likely to have had a carer’s assessment than those over 65. Husband, Partner, Dad, Son, Carer? Milligan and Morbey (2013) believe that particular important in the older male carer narratives were expressions of loss in relation to loss of futures, relationships, plans, and friends. The loss experienced in many areas of their lives i.e.no longer being able to enjoy joint pleasurable interests, sexual intimacy, ‘normal’ conversations, family worries or traumas with their partner. Research also indicates that older male carers are less likely to ask for help, tending to reach crisis point before they will make a request for support. However it is not all negative Ribeiro and Paul (2003) identified that older male cares felt that “fulfilling one’s duty and commitments” was the most frequent reasons for having positive feelings about their caring role. Giving them both a role and an ability to demonstrate their commitment to their spouse (Milne and Hatzidimitriadou’s (2003: 402). McGarry and Arthur (2001) research establishing that, for older carers, the quality of the relationship before the onset of care-giving is a key prior condition for a husband to be positive about caring for his wife. Ribeiro and Paul (2003:170 -171) research supporting the view that ‘just being there’ keeping their wives company, was the most frequent reason given for finding satisfaction in the role, this remained true even when the cared for was passive and unable to communicate (e.g dementia). Wanting to stay together for as long as possible, delaying the need for residential care and separation, with the associated feeling of ‘loneliness and purposelessness’. Linked to this for a small number of men in the research (19%) was the expression of providing care so as to not feel guilty. The Care Act, 2014, gives Local authorities (LA’s) a responsibility to assess the needs of carer’s over the age of 18, regardless of the type or level of care that the person is providing, or their financial affairs. The entitlement to this assessment IS NOT dependent on the cared for having had a needs assessment, or meeting the eligibility criteria for care in their own right. To receive support the carer must be assessed by the LA as having ‘eligible needs’, the Care Act outlining that the persons caring role as likely to have a significant impact on the person’s wellbeing because of their caring role. Are the person’s needs the result of them providing necessary care? Does the caring role have an effect on them? Is there, or is there likely to be, a significant impact on their wellbeing? To consider what the carer and their informal network are already doing for themselves or have the potential to do with a little help. Services or interventions should build upon the informal network of support from friends and the local community. That Carers are well informed and connected to support in their local community as they are then better able and willing to continue caring for longer. To respect the carer’s wishes to do things with or without the person they care for. Planning for emergencies (such as a Carer Emergency Scheme). If the carer has ‘substantial difficulty’ in communicating their wishes, or understanding, retaining and assessing information during the assessment and there is no other appropriate person who is able and willing to help them then an independent advocate should be appointed by the LA. Dury, R. 2014. 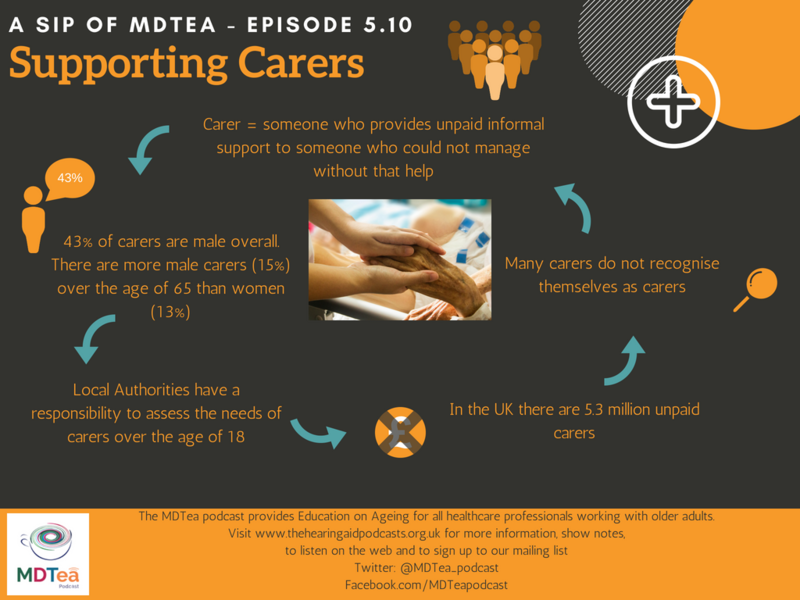 Older Carers in the UK: Who Cares? British Journal of Community Nursing. McGarry, J. and Arthur, A. 2001. Informal care in late life: a qualitative study of the experiences of older carers. Journal of Advanced Nursing, 33, 2, 182–90. Oyebode, J. (2003). Assessment of carers’ psychological needs. Advances in Psychiatric Treatment, 9(1), 45-53. Singleton, N, Maung, NA, Cowie, A, Sparks, J, Bumpstead, R, Meltzer, H (2002), Mental Health of Carers (London: Office of National Statistics, The Stationery Office). ANP (Draws from KSF) Section 16: Demonstrates knowledge of local voluntary services/community groups or organisations that can support the patient and/or their family/carers.